Buttermilk Candy. Orange-Pineapple Congealed Salad. Potato Chip Cookies. 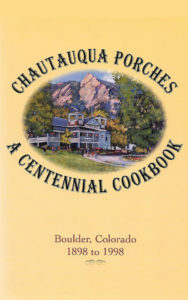 Unpretentious recipes for everyday and special occasion dishes like these fill the pages of one of my favorite Boulder community collections, Chautauqua Porches: A Centennial Cookbook published at Chautauqua Park’s 100th anniversary in 1998. You can see Boulder’s food culture slowly evolve among the recipes contributed mainly by the families who lived in the cottages in Chautauqua Park both seasonally and year-round. Classics such as Rhubarb Custard Pie, Sausage Balls and Deviled Ham Dip are interspersed with modern faves from Nicoise Salad and Rae Wining’s Malayan Sate to Chautauqua Dining Hall’s Lemon Pecan Scones. Recipes include Lemonade Pie: 1 6-ounce can lemonade concentrate, 1 can sweetened condensed milk, 1 container Cool Whip frozen in a pre-baked pie crust. Since many of the original cottage people came from Texas, Tex-Mex dishes abound in the cookbook including innumerable variations on a casserole theme including historic recipes from the first cottage collection, 1968’s Chautauqua Cookery like Green Chilies Pie from Genie Graham Warren: “Line pie pan with (roasted, peeled, seeded) green chilies. Cut Monterrey Jack cheese in slices to cover the chilies. Beat 4 eggs, pour over chilies and bake 45 minutes in moderate oven. Serve hot.” You can still find copies of Chautauqua Porches available online. 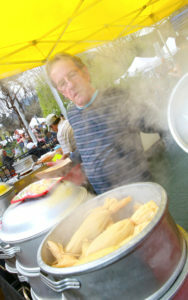 More of Boulder’s food history can be found at servingboulderlist.com, a food-centric website maintained by my foodiest friend, Laura Bloom. It includes a list of all the restaurants that have been on the northeast corner of Pearl and 15th. The list of historic Boulder area eateries is crowd-sourced so feel free to contribute your knowledge of what was where when. You’ll also find some iconic restaurant recipes including The Harvest Restaurant’s Gazpacho, Gnocchi Verde from John’s Restaurant and Chopped Liver from Boulder’s New York Deli where the undocumented worker, Mork from Ork, worked on the show Mork and Mindy. The recipe appeared in Taste of Boulder, a cookbook published for the 1995 Taste of the Nation hunger benefit event at University of Colorado’s Glenn Miller Ballroom. A deli staple for a century, chopped liver is making a comeback among fans of the Paleo diet. Saute onion in schmaltz or butter in large pan until softened. Add liver, garlic, pepper and sugar. Cook about 30 minutes. Spread on tray to cool. Process in food processor. Chop eggs finely and fold them into mixture. Season to taste. Note: This makes a LARGE batch of chopped liver. Cut ingredients by half or more to make a smaller batch. Freeze the rest in cubes to thaw and use as needed. 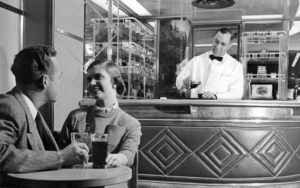 Liquid refreshments were served circa 1948 on the 20th Century Limited except when traveling through dry counties. Cocktails and appetizers will be served June 3 before a talk about the history of drinks and rail travel at Golden’s Colorado Rail Museum (coloradorailroadmuseum.org). … Trains and craft ale merge at the Rio Grande Rails and Ales festival June 18 in Alamosa (coloradotrain.com). … Meanwhile in Longmont, the BrewHop Trolley has debuted offering rides Saturdays and Sundays to nine breweries including Pumphouse, Wibby and 300 Suns on a one-hour loop, noon to 9 p.m (brewhoptrolley.com). Urban Thai restaurant at Boulder’s Hyatt Place Hotel; Community restaurant, 206 S. Public Road, Lafayette; Hickory & Ash from chef Kevin Taylor near Broomfield’s 1stBank Center; Sushi Aji, 489 U.S. Highway 287, Lafayette; Pica’s Taqueria, 901 Front St., Louisville; St. Vrain Cidery, 350 Terry St., Longmont; and River and Woods in the former John’s Restaurant space in Boulder. The best thing I’ve tasted in a long time is “The Bacon” sandwich served at Il Porcellino, 4324 W. 41st Ave. in Denver where the primary business is making the exceptional salumi you can see hanging with their overcoats of fluffy white mold in the aging room. The Bacon is an exceptionally satisfying combination of house-smoked bacon, tomato and arugula on jalapeño cheddar toast spread with housemade apple butter and Pecora cheese sauce. While you are there grab some pork rilletes, bison pastrami, mortadella, goat’s milk cheese and fresh lard (for those summer pies). On weekends, there is a line around the block for the handful of seats, but you can get takeout and sit in your car to eat it. The Bacon is that good a sandwich. Food halls — retrofitted buildings hosting multiple eateries, bars and shops are all the rage across the country including Denver’s Avanti Food & Beverage, 3200 Pecos St., and The Source, 3350 Brighton Blvd. Opening later this summer is the expansive Stanley Marketplace in Aurora with others in the metro area are in the planning stages. None of them match the variety and quality of local food and drink at the Boulder County Farmers’ Market every week in Boulder. You have well-made pan-fried dumplings (Sisters), locally grown kale salad with vinaigrette (Seeds Library Café) and spring rolls (Savory Saigon) available on the same menu with Hawaiian eggs (Falafel & Gyros) and polenta with eggs and puttanesca sauce (Laudisio) and paella (Café Aion). Dessert can range from sweet rice with fresh mango and coconut milk (The Orange Tent) and steamed pistachio tamales (Amaizing Tamales) to ice cream (Boulder Ice Cream) and drinking chocolate (Fortuna). It’s nice that you can pair it with kombucha (Rowdy Mermaid), iced maté (Rincon Argentino) or a glass of chilled white wine (Bookcliff). You would think that Boulder, one of the foodiest towns in America, could have a winterized year-round food hall, market and food truck pod of its very own. Lehndorff hosts Radio Nibbles on KGNU-FM: http://news.kgnu.org/category/features/radio-nibbles/ Please like his Facebook page at facebook.com/uspie. Comments to nibbles@boulderweekly.com. Tags: Boulder Weekly, Colorado, Il Porcellino, KGNU, Radio Nibbles, salumi. Bookmark the permalink.